And please see our options trading for beginners page. 1. How would you create a synthetic SHORT CALL? 2. How would you create synthetic LONG STOCK? 3. How would you create a synthetic LONG PUT? 4. How would you hedge an out-of-the-money SHORT CALL with a synthetic position? To completely hedge the position, use a synthetic LONG CALL at the same strike as your SHORT CALL. Buy LONG STOCK and a LONG PUT at the same strike as your SHORT CALL. You now have zero risk and are perfectly hedged. 5. If your underlying is near your upside expiration on a butterfly trade, how would you reduce your delta risk with a synthetic position? 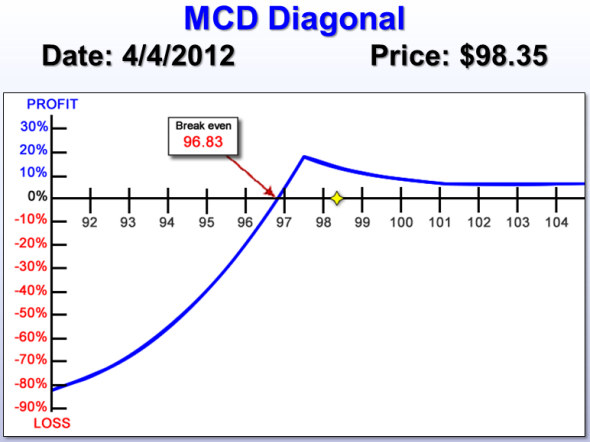 If you are near the upside expiration of a butterfly, you have negative Deltas. New need to crease your deltas. Positive delta synthetics are #1, #4 and #5 on our summary list above. Any of them should give you more positive delta. If you need a fine adjustment, use #1 or #4 as #5 (Long Stock) is +100 deltas, which might be too much, depending on your butterfly size. 6. How can you completely neutralize a 100/110 call credit spread with puts? Create a box spread. The 100/110 call credit spread is -1 100C and +1 110C. If you add +1 100P and -1 110P you would have synthetic Short stock at 100 and synthetic Long stock at 110. This position has zero risk. 7. You are long a futures contract at $100. The contract is now at $125. How can you lock in the $25 profit without selling the futures contract over the weekend with a synthetic option position? -1 125C and +1 125P should give you a synthetic short future contract, which will neutralize your long future. I hope you enjoyed the quiz. It’s good to know these relationships and practice from time-to-time with a quiz like this! A friend was taking an exam to get Customer Portfolio Margin for his option trading account recently. He showed me the exam and I noticed that 20% of the exam were questions about option synthetics! If it’s that important to an option broker, it should be important to us. My two youngest children attend the German school system. There are no multiple-choice exams: they are all essay questions. You have to show your work. Let’s do the same thing. Write down your answers for each question. Explain WHY the answer is what you say it is. Don’t just say, ___ . Show your work…you’ll learn a lot more. This is an open book exam since I can’t watch you, but try to answer the questions without looking anything up. You’ll get more out of it. Good luck with the quiz! I’ll post the answers next week. Why is AAPL becoming dangerous, and what to do? The American past time used to be baseball. But the last couple years that has changed. The new American past time has become get long AAPL any way you can and wait for the profits to accumulate. Over the last 2 years, AAPL has gone from around 190 to 500, you figure the yields, staggering! Since June 20, AAPL has risen from 315 to the current level of 502, 60% in 8 months! Let me say that one more time, 60% in 8 months! So why shouldn’t it continue and why is it becoming dangerous? I’m glad you asked. Over the last 2 weeks, AAPL has shown a changed personality that you should be aware of. This personality is much different than the fun loving, get on my back , and I’ll take you up, up, to always higher stock prices. From a psychological perspective, this personality change started about 2 weeks ago around February 3. AAPL was trading at 460, and the March at-the-money implied volatility was around 19. What does that mean in English, Spanish, and Portuguese? It means everything was OK, and no real fear of the downside was propping up. But was it? The speed to the upside was really picking up. From November 25 to February 3, AAPL went from 363 to 459, 26% in a little over 2 months. Everybody wanted in! On February 10th, AAPL hit 493 and March at-the-money implied volatility in the calls spiked to 27. What’s the big deal? Option volatility usually decreases on the upside as prices go up and fear of the downside isn’t usually there. And remember, this is AAPL, this is America! But the last week, the personality disorder got much worse. As AAPL climbed a bit higher to 500, the March at-the-money option volatility climbed higher to 32 in the calls. That is an increase in 2 weeks from 19 implied volatility to 32 , an increase of 68% with the stock rising. Why are the option volatilities going up and what does it mean? First of all why are the option volatilities going up? SPEED!! Look at a pivotal day, Wednesday Feb 15, AAPL traded intra-day to 526 and closed at 497. That’s a decrease of 5% from the daily high to the close. The stocks rate of speed up and down intraday is really picking up in both directions. Sellers are coming in a bit! The last time I really saw this kind of speed to the upside was the internet debacle many years ago when stocks were screaming to the upside, do you remember what happened after they went up very fast? What does increasing option volatility mean to the retail trader? It means the green light on the stock may possibly be turning to yellow and you should exercise a bit of caution. Does this volatility news mean I can’t stay bullish on my beloved AAPL? No, it just means HOW you get long may need to change. This leads me to the strategy for today if I want to be long AAPL but be cautious! Strategy idea: With this disturbingly changed personality in AAPL the last 2 weeks, I would approach any bullish trade very cautiously and make sure the risk/reward looks acceptable to me. In other words, if AAPL nosedives, I’m very comfortable with my total downside risk. I would initiate the below strategy after 1-2 down days. Strategy example: Stock at 502.5 Buy 1 March 500 call and sell 1 March 505 call for a debit of around $2.40 ( $240). This strategy called a vertical debit spread, allows you to play a high priced stock for a very reasonable cost. We are actually selling an option with more time premium than we are paying for with our long. This is good considering option volatilities called implied volatility have skyrocketed the last few weeks. The risk/ reward is about 1 :1 meaning we can make $250 profit potential with maximum risk of $250. If the stock is 505 or higher at expiration ( 2 ½ dollars higher than the current 502 level), I can make 100%. This again is a cheap way with limited downside risk ( $250) to play a very expensive and volatile stock. /wp-content/uploads/2015/04/logo_svg_full_name_white.png 0 0 Dan Sheridan /wp-content/uploads/2015/04/logo_svg_full_name_white.png Dan Sheridan2012-02-20 17:29:122018-04-25 17:03:19Why is AAPL becoming dangerous, and what to do? This is what’s known as doing a “long calendar spread.” We’ll touch upon the “short calendar” a little bit later. Today’s trade idea shows you how to establish a long calendar in the SPDR S&P 500(NYSE:SPY) – and not only will you get an options trade today, but also the logic behind setting it up this way. * Both option types must be the same (i.e., buying a put and selling a put in the same strategy, or buying and selling calls). * You may have traded what are called “vertical” spreads in the past – options with the same expiration dates but with different strike prices. With the calendar spread, you have the “option” of trading the same strike price because you’re using different months. This can be helpful in making money with options without needing the stock to make a big movement. Let’s take a closer look at an example, and then at a trade idea in the SPY, through this Q-and-A. How can we play the SPY with an options calendar spread? With SPY trading at $134, an example would be to “buy to open” 1 SPY April 134 Call at $4 and “sell to open” 1 SPY March 134 Call for $3. The cost of the spread would be $100 per contract ($4 – $3 = $1 x 100). On time decay, as we approach expiration and the SPY stays near $134, the March options will decay quicker than the April options. Can we only make profits at the strike price? No. In this example, your break-even points at expiration are around $130 and $138, so you can still make money even if the stock moves a bit away from that $134 strike. How about if the stock moves too far? One idea is to reposition the calendar. For example, if we move from $134 in this example to $130, we can take off the $134 calendar completely (i.e., sell the long April call and buy back the short March call) and put on a long call calendar at the $130 strike. Would you put on a long call calendar at the $134 strike in SPY today? No, but I would probably put on a long calendar at the $132 strike in the puts. 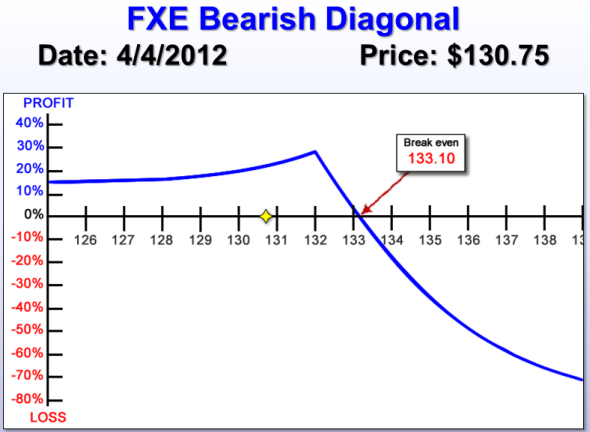 An example would be to buy 1 April 132 Put and sell 1 March 132 Put. Why would you put on the calendar at the $132 put strike? With calendars, I want the stock to go to the strike price of the calendar. And right now, I’m slightly bearish. What price would you pay for the April-March 132 put calendar? It closed Friday at $1.40, so I would wait for an up day in the market and try to get it for $1.25. Why would you wait for an up day to enter a bearish calendar? Because the option volatilities would be lower and I like to enter these bearish calendars after a few up days, to get a better price. How can you buy a calendar at $1.25 when it is trading at $1.40? I have to be patient and wait for the stock to trade back up to around $135.40. Once you buy the calendar at $1.25, what will you do if you’re wrong? After I buy the calendar at $1.25 (if I do), then if SPY goes to $138 – although the SPY hasn’t hit $138 in years — then I might re-position the spread to $138. Can you explain what you mean by “re-positioning the spread”? Sure, if I’m wrong and SPY rallies up to $138, I will take off the $132 calendar completely and then enter a calendar spread at the $138 strike in the calls. An example would be to buy 1 April 138 Call and sell 1 March 138 Call after I close out the $132 spread. This wraps up a frank discussion between Dan and himself on the calendar strategy in SPY Dan has his eyes on. Today we talked about the long calendar strategy. There is also a short calendar strategy, where you’d instead buy a longer-dated option and sell a shorter-dated option. But that is considered to be unhedged and, therefore, your broker would be looking for you to put up a significant amount of margin. So, the long calendar is lower-risk and may be a more-familiar strategy if you’re used to doing traditional vertical spreads and/or covered calls. Plus, you’re “hedged” here, which means the full amount you have at risk is what you pay for the spread. And your profit potential can be unlimited, particularly when the short option expires and not only is the credit yours to keep but you can also benefit from any additional movement that benefits the long (longer-dated) option. One of the questions that frequently comes up with option traders who have only done the equity side of options is how do I get into trading futures options and what do I need to know before I start? There are several basic things you should know and understand about futures and their option before you get started with live trading of them. What month should I trade? One of the first characteristics to consider is that futures do not always have a new contract every month. Many futures, U. S. Treasury bonds for instance, have only a few contract months per year. Treasuries have March, June, September and December only. All the months in between have options only that are traded derivative of the next futures month. Strategies, such as time spreads must be placed carefully to insure that you are trading off the same underlying contract month. Get to know your futures and options expiration periods before you start. Not only the contract months differ from the equity world, trading hours do also so be sure to know when your underlying is being traded during the day and night. What is the tick size? Tick size for the different futures and options is different than many equities also. And the tick size of the options and the future itself can be different. Using the bond example again, the future tick size is $31.25 per tick and the options are $15.625 per tick. Futures trading can be larger and highly leveraged, it is important to understand how each tick movement is effecting your position. What type of strategy should I trade? Once you have a basic understanding of the future and its options you wish to trade you can begin to look at what strategies to employ. Non-directional or directional strategies such as iron condors and calendars can be used but be careful with the time spreads that you are using the same underlying contract month as I mentioned earlier. From my own experience it seems iron condors either even on each side or sometimes weighted heavier on one side or the other can be a solid month-to-month trade. Sometimes short or long straddles can be appropriate also. Don’t trade without a PLAN! Having a PLAN is the most important part of trading any underlying, whether you trade futures or equities. Before you enter any trade you should know and have a plan for how and when you will exit the trade at a profit or a loss and at what point you would adjust or reduce risk a trade that is going against you. In my experience mentoring new traders that is the most common mistake I see being made. You must also stick with your plan and try to control the emotions that would have you staying too long or not long enough in a trade. Your trading PLAN is fundamental. Don’t trade anything without one. If you follow these steps, you should have a good start to learning how to trade futures and futures options. Trading always involves risk; learn to control it as best you can. Is it Treason to Short Apple? It seems like Apple (NASDAQ:AAPL) has replaced the Dallas Cowboys as “America’s team.” And yes, I know it is a great stock – one that might actually be undervalued. But at the risk of sounding almost un-American, I think it’s time to start getting short AAPL. Sure, the company just announced record – heck, downright mind-blowing – earnings thanks to iPhone 4S, iPad 2 and international sales. Even Wall Street analysts were impressed with the final numbers. Unprecedented sales figures for the company aside, I’m a trader and, therefore, looking ahead to what the stock’s going to do next. With all the good news for the company, the stock has been climbing … but it can’t possibly go straight up without any down days. In other words, even AAPL has to have a few days or weeks to act “human” … and you should get positioned to profit from the pullback when it comes. As a trader, I am not concerned about AAPL long term. But here in the short- to intermediate-term, it’s quite reasonable and even wise to look for a little healthy downside trading action. Here’s a trade idea for the speculative part of my options portfolio. Trade Idea: With AAPL trading here around $447, you can “buy to open” 1 April 430 Put (which would cost you about $12) and, at the same time, “sell to open” 1 April 410 Put (for which you would collect $7). To enter this trade, which is a put debit spread (or a bear-put spread), your total cash outlay would be $5 per share, or $500 per option contract ($12 – $7 x 100). You could simply buy the April 430 Put on its own, but by selling the $410 put against it, you instantly reduce the amount of money you would otherwise have at risk in the trade. The spread is costing me $500 and the most I can make is $15 (the difference between the option strikes, or $430 – $410) if the stock is trading at $410 or lower at April expiration. My total risk in a put debit (or bear-put) spread is the same as being long an option. Whatever I pay, which is $500 in this example, that’s the total risk. The cost of the spread at current prices is closer to $5.30, but I am going to be patient and let it come to me a bit. If the stock goes up a couple bucks from here, I should get filled. Last week when I told you that it’s time to get a bit short, I also mentioned that you should enter your options trades by “nibbling,” or scaling in by buying your position in thirds. Here, too, I am initiating this spread with 1/3 of my total intended position size. I am starting with one contract here and will work up to my total of three contracts as the stock increases. Will I wait till April options expiration to get out of this? No way! Once we get a little pullback and the put spread gains some profits, I’ll head for the exits. I’d like to make a minimum of $2 on this spread. By getting in at a good price, by scaling into the spread at less than my maximum size, and by using options with an April expiration date, I have lots of time to wait for a small pullback. That’s my plan and I’m sticking to it! Whatever happens, I will follow this trade to completion with you. Stay tuned to see if AAPL is really human. I’m betting it is! /wp-content/uploads/2015/04/logo_svg_full_name_white.png 0 0 Dan Sheridan /wp-content/uploads/2015/04/logo_svg_full_name_white.png Dan Sheridan2012-02-01 17:34:052018-04-25 16:55:50Is it Treason to Short Apple? I’m not drinking the Kool Aid: time to start getting a bit short! I know the title sounds a bit bold, but stay with me. Where is most of your money stashed? I’m not trying to get personal, I promise! But for most of you, I bet it’s in your retirement account. Another question, will the stuff in your retirement account be happy if the market goes up or down? The answer for most of you is up! Your portfolio has a strong bullish bias for the majority. 2008 hurt so much because most of your assets were in the market when everything fell apart between September 2008 and March 2009 ( 8 months of torture). Do I know something you don’t know about the market? Of course not. What I do know is that your portfolio is probably leaning long, the market is in the upper end of the range, and I’d personally like to start having a few puts around. I’m going to focus on the SPY. Currently trading at 131.54. The 1,2 and 3 year high is around 135. You still have to respect the trend, which is up, but I’m starting to get some bearish soldiers ready to help out all my bullish soldiers who are getting a bit excited about the upside. SETUP: Because the trend is up I would scale into some puts. What does that mean? If my size is 9 contracts, I might buy 3 to start , then buy 3 more maybe at 133 in the SPY, and work up to 9. STRATEGY: With SPY at 131.54, I might start nibbling and buy the March 127 puts at $2.00. Why March expiration? I want to give myself time and the option premiums are cheaper than they usually are. March is over 50 days from expiration. Nibbling means buying maybe 30% of my intended size. You say, “Dan, the March 127 puts are trading at 2.28, how are you going to get $2?” There is a phrase that says “let it come to papa”. What does that mean? It means if the market is in a bit of a trend don’t be aggressive with the price. When would this order get executed? Probably when SPY hits between 132 ½ and 133. I might use a GTC order when entering this trade. What do you mean? Because I am entering my price below the market, it make take a few days to execute, so a good till cancelled order means my $2.00 bid will stay active and I don’t have to put in a fresh order every day. What if the market goes down before I make my put purchase? We miss it! That’s part of the game. This is more of a passive put purchase plan, if I wanted to be more aggressive, I’d pay more. I’d be a little passive, respecting the trend. If VIX hits 24-25 area, start evaluating your retirement account to see if you need some downside help. Not going to really elaborate on the VIX today, and don’t want you to stop enjoying the upside bliss. But I want you to be aware of when the wind might be changing to the downside. Remember Mary Poppins ! 24-25 area would be an indicator the market is starting to move down, but not out of control yet. Merely a warning worth looking at! If the trade goes against me, I will discuss a few adjustments I usually use to fix a put gone bad. Have a great day! /wp-content/uploads/2015/04/logo_svg_full_name_white.png 0 0 Dan Sheridan /wp-content/uploads/2015/04/logo_svg_full_name_white.png Dan Sheridan2012-01-27 17:35:072018-04-25 16:55:03I'm not drinking the Kool Aid: time to start getting a bit short!